Because gnome lore in World of Warcraft is… light. There is a lot of room for head canon. When coming up with my head canon I try to look back at what is there and infer as much as possible for the source material before I start creating things from whole cloth. What can be inferred about gnomes from Warcraft 2 lore and game mechanics? T here are two gnome units and one gnome building in Warcraft 2, the Gnomish Flying Machine, the Gnomish Submarine and the Gnomish Inventor. The first to become available is the Gnomish Flying Machine. It’s built at the Gnomish Inventor building. The submarine is built at the shipyard, just like all Alliance boats, but requires the Gnomish Inventor to be present. W hen World of Warcraft launched in 2004 there were really only 2 gnome characters of any note, Mekkatorque and Thermaplugg. It’s suggested in the lore that Mekkatorque has been High Tinker since before the Second War. Therefore I feel like it’s safe to assume that he lead the gnomish forces in that conflict, making Gelbin Mekkatorque THE Gnomish Inventor. W e see in concept art for Heroes of the Storm that Mekkatorque is a pilot of a Gnomish Flying machine. This makes sense, his most famous inventions are forms of transportation, the Mechanostrider and the Deeprun Tram. So his role as a pilot would not contradict anything we see him do in game. It is further supported more by the suit of power armor he pilots on the Broken Shore in Legion. Mekkatorque seems as comfortable behind a control panel as he does with a melee weapon. I f we assume that Mekkatorque lead the Gnomish Air Force during the Second war, I think it’s safe to assume that Thermaplugg was Admiral of the Gnomish Navy. 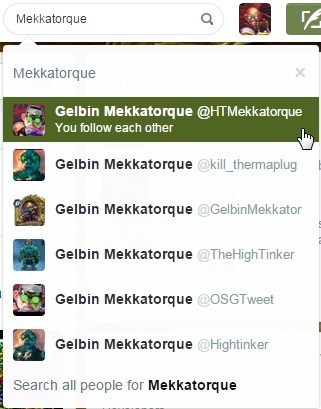 Thermaplugg would not have been on the same level as Mekkatorque. He would have been under the command of Grand Admiral Proudmoore from Kil Tiras. The lore descriptions of how the subs were used in Warcraft 2 imply that the gnome submarines were under Proudmoore’s command. I would love to see a remastered Warcraft 2 RTS that featured Mekkatorque as a hero Flying Machine unit, and Thermaplugg as a hero Submarine unit. I f we look further at the game mechanics to give lore hints, we find something else. There are two dwarven units in the game too. The Gryphon Rider, which is a Wildhammer dwarf, and the Demolishion Squad, from underground Kaz’Modan. The thing is, the Dwarves of Ironforge are the second unit you get from the Gnomish Inventor. I think that while the Wildhammers were going all in with the Alliance Forces, Ironforge was holding back, and the Ironforge dwarves that did participate were under the command of Mekkatorque. W ildhammers are said in the lore to be separate and distrusting of the other dwarves. They even have their own building for their unit. But the Ironforge dwarves come from the Gnomish Inventor. It supports the idea of the strained relationship between Wildhammers and Bronzebeards. If Ironforge feels about the same way towards Wildhammers as Wildhammers feel about them. I could see Magni not wanting to commit to the Alliance fully because the Wildhammers were featuring such a predominate role in it’s formation. Is it really a stretch to think that Magni would want to keep the Wildhammers, and by extension the Alliance, at arms length? Here is this large organization forming, that includes both friendly trading partners and old rivals. He can’t snub them by refusing to join, and the threat too Azeroth as a whole is large to be ignored. So rather than put Ironforge dwarves at risk of having to take orders from Wildhammers, he asks Mekkatorque to take the role leading Ironforge and Gnomeregan’s combined forces. That way he can send aids to his allies, and defend Azeroth, without having to buddy up to the Wildhammers. All that political and military entanglement of Ironforge and Gnomeregan could lead to Gnomeregan catching the attention of the Dark Irons… but that’s a path we can go down later. I have not had a chance to read Chronicles Volume 2 yet, but from what I have heard there is not a lot of development of either Gnomeregan or Ironforge from the Warcraft 2 era. I really wish that some distance would be put between the Gnomes and Dwarves in Warcraft. They can be friends with being shoehorned in to the same niche in the lore. At this point they remain inexorably tied to one another. I hope that they will continue to work on making each more unique by diversifying their kits in different directions. I have been spurned again! I can’t believe it! Mekkatorque won AGAIN! That’s it. It’s time for PLAN B! And you know what!? While I am at it, Let go ahead and do PLAN C and D too! You will regret doing this to me!!! See you on the other side of the election! Ressa brought the PR firm back. They ‘work shopped’ the campaign slogan I had. (They called it a ‘workshop’ but they didn’t have a workbench or anything.) I’m annoyed they insisted it not have my name in it. How are people supposed to know it’s me? Whatever, I’ll try anything once.